Ports-to-Plains initially began back in the mid-nineties as an initiative to extend Interstate 27. Traffic counts and other factors made that a difficult challenge at that time, but we spoke with partners in industry and at state departments of transportation who said that improving the corridor to a complete four-lane-divided highway with relief routes would still have a significant economic impact and greatly improve safety. After nearly 20 years of hard work and many successes in upgrading the highway, the Ports-to-Plains board of directors has chosen to renew our efforts to seek the extension of I-27. For the most par,t our initial efforts were enthusiastically received by our members. While the plan does not yet have formal approval from the Texas Department of Transportation yet, we believe that it is achievable. Seeking future Interstate designation for an extended I-27 (initially in Texas) will be a major focus of our organization. We will need your help. What can you do? The most important thing is to be heard. 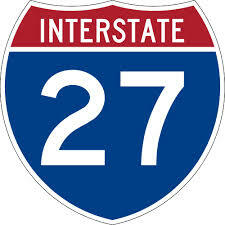 Let your local TxDOT district engineer know that you would like to see I-27 extended. Let your elected officials, at the local, state and federal levels, know that this is a priority. 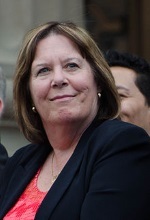 We will be meeting with DOT and elected officials, but you are our most effective advocates. You can continue to follow developments through this newsletter, and we will also provide updates and more specific requests in the future. Provide facilities that can effectively meet the traffic volumes and vehicle types that are traversing the corridor. The Nebraska Department of Roads (NDOR) and Governor Ricketts announced today $300 million in transportation construction investments, including U.S. 26 from Minatare to U.S. 385, as a 4-lane divided highway, as well as the design of 12 projects, including U.S. 385 from Alliance to Chadron, as a Super 2, and planning of two others. Funded through the Build Nebraska Act (BNA) and the Transportation Innovation Act (TIA), and championed by the Governor, these projects will improve safety on our highways, promote economic growth throughout the state –and fulfill the vision of former Governor Kay Orr in 1988 to expand Nebraska’s Expressway System. NDOR has committed construction on all projects will begin by 2024. Design of U.S. 385 from Alliance to Chadron, as a Super 2 for 59 miles. The Heartland Expressway Association is extremely happy to learn that our priorities for the next phases of the 4-lane highway mirror those of the NE Department of Roads. Having the Minatare to U.S. Hwy 385 section listed as a construction project by 2024 assures the completion of the remaining 18 miles needed to complete the 4-lane portion from Kimball to Alliance. 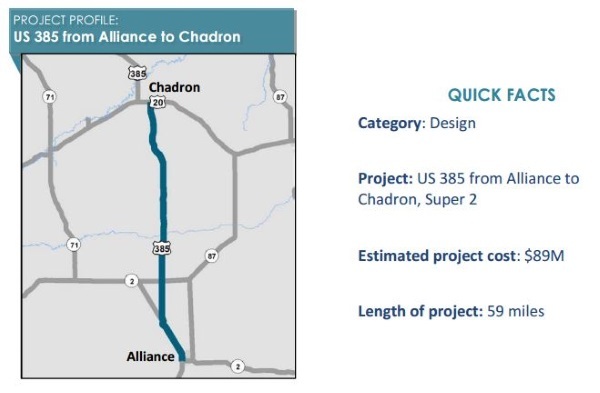 We are also pleased that the 59 miles from Alliance to Chadron will be added to the design list as at least a Super 2 configuration, which assures that it will be in line for funding at some point in the future. Our experience in working with the NDOR on this new prioritization process allowed us to have a direct input into that selection. We look forward to continuing that work. HEA would like to thank not only the NDOR Director Schneweis, but also Governor Ricketts, U.S. Senator Deb Fischer and members of the NE Legislature including Senator Al Davis of the 43rd District, Senator John Stinner of the 48th district and Senator Ken Schilz of the 47th District for their long-time support of this project. 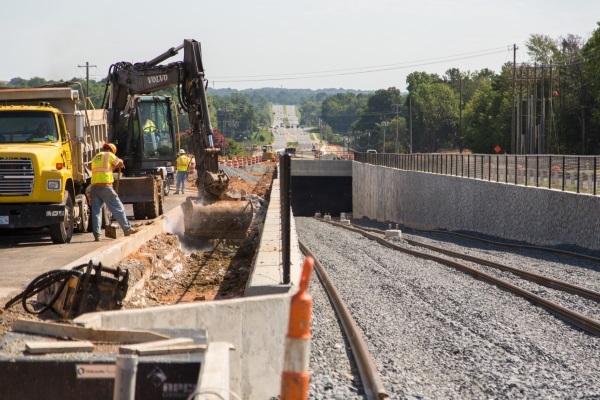 We are seeing more and more states taking proactive steps to address transportation funding challenges. In 2015 and 2016, more than a dozen states including Texas are raising additional revenue for transportation. Sixty years ago, the United States embarked on one of the most ambitious and successful undertakings in the history of the federal government. In June 1956, President Dwight D. Eisenhower signed the Federal Highway Act, which created what we have come to know as the Interstate Highway System. A vast network made up of some 47,000 miles of roads, the system has transformed our nation economically, culturally and geographically. The system, which took decades to build, fundamentally altered where and how Americans live. Suburbs were born, new industries were created and the shipment of goods by truck over long distances radically changed almost every sector of the economy. In 1960, with the system in its infancy, Americans drove approximately 7.19 trillion highway miles per year, according to the U.S. Department of Transportation; in 2014, that number had risen to 30.25 trillion. Like many others attending the 107th Montana Association of Counties conference in Billings on Wednesday, Gov. Steve Bullock helped himself to some of the freebies offered to attendees. Before addressing county commissioners from around the state, Bullock held aloft a four-way screwdriver provided to attendees by Stahly Engineering & Associates, which has offices in Bozeman and Helena. 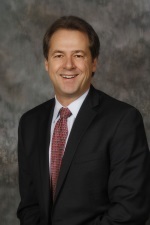 Bullock said Montana’s county commissioners are more fortunate than the nation’s 50 governors. “We never get these at the National Governors Association,” he said. U.S. production began inching up in July, shortly after oil prices rebounded to $50-a-barrel territory. Producers quickly put 100 rigs back to work this summer. When oil prices began to plunge two years ago due to a global glut of crude, experts predicted U.S. shale producers would be the losers of the resulting shakeout. But the American companies that revolutionized the oil and gas business with hydraulic fracturing and horizontal drilling are surviving the carnage largely unbowed. 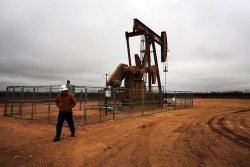 Though the collapse in prices caused a wave of bankruptcies, total U.S. oil production has only fallen by about 535,000 barrels a day so far this year compared with 2015, when it averaged 9.4 million barrels, according to the latest federal data. America needs decision makers that support energy policies that will create jobs, grow our economy, and increase America's energy security. Looking for a simple way to make your voice heard… to elected officials… even to your community. Just go to Energy Citizens’ website. Improved infrastructure and increased oil and gas development is key to our rural and urban economic success. It is imperative that we have access to affordable energy and a safe way to transport that energy be that roads, railways or pipelines. This focus will also help to create thousands of jobs that we desperately need to rebuild our economy. Not to mention, domestic production will decrease our dependence on foreign oil from hostile nations that do not have our best interests in mind. We need to take care of ourselves. The great news is we have the ability to do just that by supporting improved infrastructure and gas and oil development for this great nation. Being part of Energy Citizens has been a great way to help advocate for our energy independence. 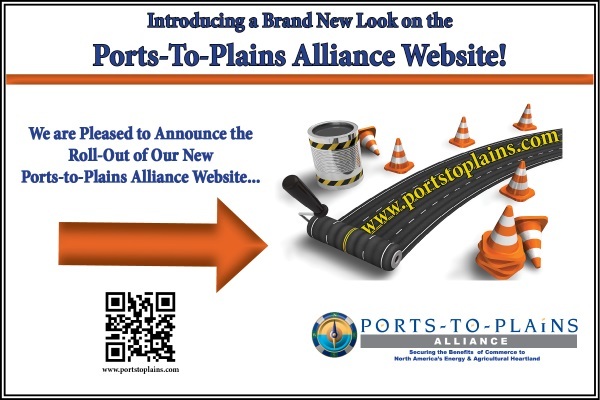 It is easy to stay updated on current energy issues and allows me to easily share this information with our Ports-to-Plains Alliance membership and take action. If we are all working together towards the same goal, we can each make a difference and bring us closer to a secure energy future for America and help bring us one step closer to energy independence.